With waterjet technology, we can make quick work of even the most intricate and sophisticated foam cutting applications. Prototypes and short runs are also perfect for this technology. Concepts are rendered using the latest software programs. During production runs changes can be made "on the fly" with no additional charges. No design is too intricate for us to create. We involve you in the process from rendering to finish. 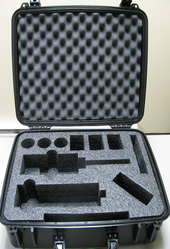 We can create a foam insert designed to keep the most delicate materials safe during transport. Polyurethane Foam: Polyurethane foam is an elastic cell structure. Poly-Ester/Polyurethane: An open cell flexible polyurethane foam which is also available in anti-static. 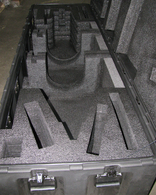 Poly-Ether/Polyurethane: A low cost, open cell foam which is also available in anti-static. Polyethylene Foam: A closed cell foam which will not absorb water or moisture). 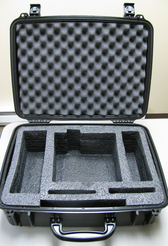 The 3 most commonly used foam polyethylene densities are: 1.5#, 1.7#, and 2.2# . All densities are also available in anti-static.